Paintings done on Plexi-glass, then pressed and printed onto French/Italian wet paper. 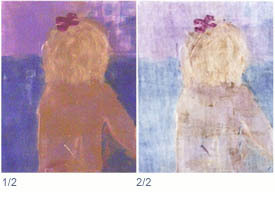 Traditionally a first print (identified #1/2) is printed and then a ghost print (#2/2). See BEACH BABY above for example. 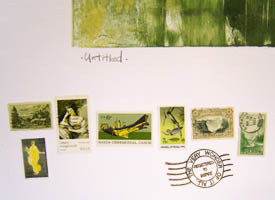 During subsequent collage or image transfer, works often undergo additional color runs on the press before a one-of-a-kind "Monoprint" is created. Often found near the artist's signature on Monoprint works, a small extra print or design, often used somewhat like a Chinese Chop mark. While designing a souvenir gift line using vintage US postage stamps, I started fabricating "postal cancellations" for use as my alternate form of the "Remark."